THE 'war on terror' long ago added 'waterboarding' and 'rendition' to the language of public life, but only now is the scale of abuse committed during the 'war' truly becoming apparent. Courtesy of a report released in August by the CIA inspector-general, we now know, for example, that CIA officers also carried out mock executions and threatened to kill detainees' children. Even so, the public account of the CIA's activities remains incomplete. Several parts of that report were almost entirely deleted - and one of those described the operation of secret detention sites in Europe. EU governments should fill in those gaps in our knowledge. To those in Brussels, the charge sheet should be familiar. In November 2006, the European Parliament confirmed that EU member states "had knowledge of the programme of extraordinary rendition and secret prisons"; it accused Italian intelligence officials of assisting in the CIA's kidnapping and rendition; it condemned the Swedish government's complicity in two CIA renditions in 2001; and it identified the German government as complicit in two renditions. All those 'rendered' were subsequently tortured. Then, in a 2007 report, the Council of Europe confirmed the existence of secret CIA torture centres in Poland and Romania. This summer, ABC News reported that Lithuania had housed a 'black' - secret - site. Some EU governments have responded, but their investigations have been truncated or short-circuited. Courts in France and Sweden quickly shelved criminal complaints. An Italian court is now trying Italian agents for the abduction of a suspect, Abu Omar, to Egypt, but the constitutional court ruled that key evidence should remain secret, and the CIA agents allegedly involved are being tried in absentia because the government refused to seek their extradition. Similarly, the German government is refusing to seek the extradition of CIA agents for the rendition of Khaled el-Masri; a Bundestag inquiry into alleged state complicity in that and another case proved a whitewash. Spain has only now acknowledged that- under the previous government - the CIA used its airspace for rendition flights. The UK has opened investigations into two instances of secret-service agents' alleged complicity in the torture of US-held detainees, but has refused to order a full inquiry into complicity in abuse in third countries. In Romania, a parliamentary investigation unconvincingly dismissed accusations of a 'black site', while Poland will keep secret the results of its investigation into similar accusations. In Lithuania, a special parliamentary committee has yet to begin work. With the election of Barack Obama in the US and an end to the most outrageous CIA practices, the temptation may be to argue that the worst is over, that nothing is to be gained by coming clean and that the principal issue left by the 'war on terror' is to find homes for Guantánamo Bay detainees. In fact, however, the Obama administration has indicated that it may send suspects to third countries that are willing to provide diplomatic assurances that they will not use torture. But in case after case, assurances given by the Bush administration proved completely ineffective. Mechanisms need to be created to ensure that Europe is not again hoodwinked into rendition and housing torture sites. 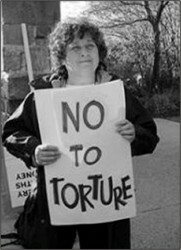 It is equally important that Europe hold accountable those who authorised torture. Until then, the stain of torture will remain on its soil.